On 2 April, Malcolm Turnbull will equal Tony Abbott’s 30 negative Newspolls with the Coalition far behind Labor. In response the government is stepping up its racism in a desperate effort to find some support. Peter Dutton’s call to fast-track visas for white South African farmers was a throwback to the worst kind of a racist, white Australia mentality that was a new low, even by his own standards. His comments that they need help “from a civilised country like ours” were shocking, and drew international condemnation, but not from Turnbull or other Liberals. 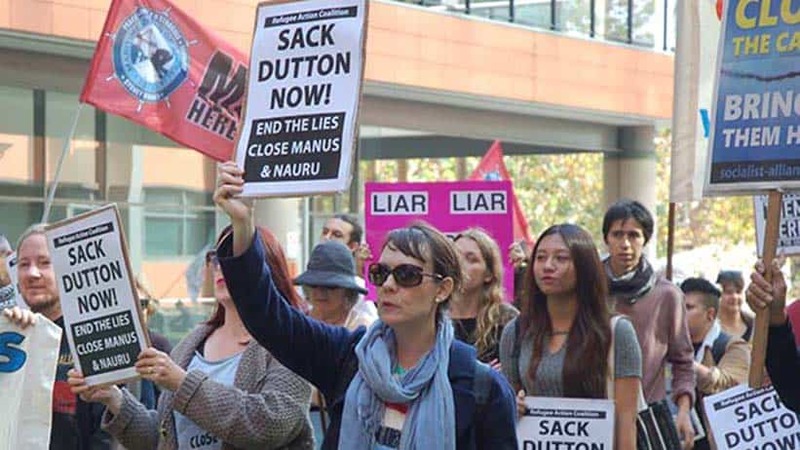 Tony Abbott and a chorus of hard right MPs even came out to praise Dutton’s proposal. Dutton’s racism is even more astounding when the government has refused to consider any special intake for the 800,000 Rohingya living in desperate conditions in camps after fleeing genocide in Burma. Instead Malcolm Turnbull has maintained military ties with the Burmese army that has carried out the killings. And, of course, the government’s compassion doesn’t extend to the 1500 asylum seekers and refugees it has been torturing for nearly five years on Manus Island and Nauru. And the Coalition is making another push to whip up racism against migrants, bringing back their citizenship changes rejected by the Senate last year. This effort to impose a harder English language test and longer waiting times for citizenship is designed to scapegoat migrants for unemployment and declining services. Minister Alan Tudge turned the racist rhetoric up a notch in a speech in March, claiming new immigrants were living “within a language and cultural bubble”, and warning of the supposed “slow death of Europe”, due to immigration “as groups effectively colonise parts of it” and threaten its “values”. The more the government resorts to racism, to divide and rule, the more we need link up the fights for migrant, refugee and Indigenous rights. But there was not a peep from Bill Shorten to condemn Dutton’s comments about South Africa. Labor’s silence only helps the Liberals. The closer the federal election gets, the more we need to fight to break Labor’s bipartisan support for offshore detention. Turnbull has launched a new offensive to get his corporate tax cuts through the Senate. He wants to hand another $65 billion back to big business. The Liberals have also launched a scare campaign against Labor’s plan to end tax breaks for shareholders through dividend imputation. As if the Liberals care for pensioners. The change could raise almost $5 billion a year. It adds to the series of policies that Labor has announced, including changes to negative gearing, taxing the top 2 per cent of income earners and taxing family trusts, that could be used to fund hospitals, schools and jobs. Labor has tacked left, but they are still committed to conservative financial management and running the system. We can’t just wait and hope a future Labor government will deliver meaningful change. The ACTU’s campaign to change the industrial rules will shape the fight against Turnbull in the months ahead. So far its main action has been the release of a TV ad. Sally McManus’s speech to the Press Club on 21 March, billed as “the most important speech by a union leader in a generation” barely mentioned industrial action or the right to strike. The ACTU remains focused on an electoral campaign aimed at getting Labor into office, although Labor’s promises to change the law are nowhere near enough. The unions’ call in Victoria for a mass union delegates meeting on 17 April and a stopwork rally on Wednesday 9 May shows the way forward. This needs to be replicated in every major city. The bosses are already trying to boost their profits, aggressively cutting conditions by terminating agreements and crippling unions with fines. An ongoing industrial campaign can challenge the bosses’ laws that restrict and fine union action. To fight against casualisation and stagnating wages we need a fighting union movement willing to defy the bosses’ laws and fight for the right to strike.